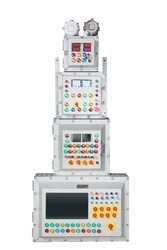 We are reckoned name engaged in manufacturing and supplying the superior quality Flame Proof HMI Panel. These panels are specially developed to render zone 1 and zone 2 protection from inflaming explosive gases. 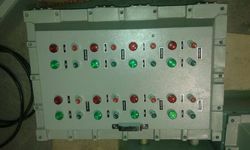 The offered panels are widely utilized at motor control centers as we make sure to adhere to the highest standards of quality and safety. Developed from industry approved aluminum material the offered panels are accessible in a wide dimensional range which can be ordered from us at a nominal price. Sizes : 280(H) x280(W) x175/24/280/300(D). Rated Voltage : 250V AC 50/60 Hz. • Sizes : 280(H) x280(W) x175(D). With the aim of attaining pinnacle success in the market, we are engaged in manufacturing and supplying best quality Fireproof Enclosures. We are leveraging cutting edge technology to develop quality compliant enclosures for electronic instruments. Fabricated by using premium grade LM6 aluminum alloy, these enclosures belong to I/ IIA/IIB gas group. Featuring IP66 protection rating and customized design specifications these enclosures are accessible from us at a nominal price. Flameproof - Weatherproof enclosure for electric gong bell/hooter unit. 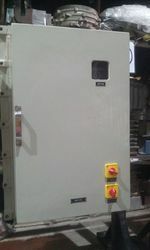 We have gained huge repute by manufacturing and supplying highly demanded Flame Proof Enclosures/FLP Enclosures. 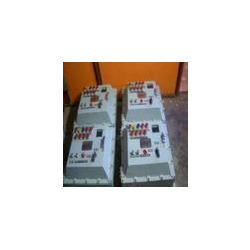 Thoughtfully designed for variable frequency drive panels and junction boxes, the high performing enclosures are widely demanded for dimensional excellence. 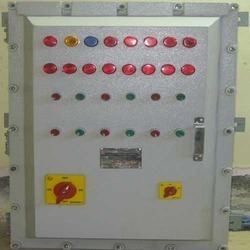 Featuring optimum protection in explosive environments, these panels are available in varied sizes with zone 1 and zone 2 protection at a nominal price.We supply in pune,chennai,banglore,indore,kanpur,ankaleshwar,bhopal,gujrat.